Aelred of Rievaulx was an heir of Saxons living under Norman rule, a native speaker of English daily speaking French and Latin, a descendant of generations of married priests in an age when priests were forbidden to wed, an English monk in a French order, an abbot bred to service in the church but trained for service in the court. His sermons and treatises reflect Aelred the monk, the novice-master, and abbot. His historical works—concerned with the political world of Anglo-Saxon and Anglo-Norman England—seek to explore the past as a guide for the present and assurance of the future. Drawing on the Bible, the Fathers of the Church, classical writers like Cicero, and medieval historians such as the Venerable Bede and Symeon of Durham, Aelred insisted on the importance of history for guiding human action, declaring that the meaning of the past can only be known in the present and that only at the end can one understand the beginning. 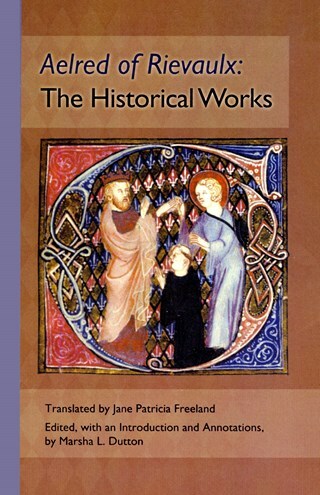 In this volume are four of Aelred’s seven historical works: Lament for David, King of the Scots (1153), The Genealogy of the Kings of the English (1153-1154), The Life of Saint Edward, King and Confessor (1162-63), and The Battle of the Standard (1153-54).
. . . blessedly supplied . . . with a full set of references, and gracefully written.